The Burden of Active Learning? I always thought the whole point of active learning was to shift the focus of activity off of the professor and on to the students. Active learning is about having students solve problems, answer questions, formulate questions of their own, discuss, explain, debate, or brainstorm during class – thereby increasing their engagement with learning. 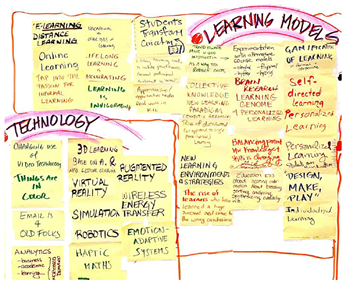 I certainly saw active learning being modeled when we met at the Future of Education conference and created the poster to the left. We were “doing”…and the focus was on the learning! This is just one active learning technique, and Richard Felder illustrates many more in his excellent resources at his website on Student-Centered Teaching and Learning. Linking HPL to Active Learning may help keep the focus off “active” and on to where it belongs, “learning.” We shall see. I am wondering if any of you have good advice for new faculty on active learning? Yes… please… any and all advice about this topic would be welcome! I am really struggling with creative active learning strategies in my first semester teaching. I know I am spending way too much time developing a PowerPoint every week, and I am not spending enough time coming up with meaningful examples and activities… even though I know that the activities are more important! I am finding it difficult to ensure that the students are exposed to all of the key terms and concepts in ways that will help them really understand the material, especially when there is a LOT of material! All of my students are working adults, and I know that many of them come to class without doing the assigned reading. Your post made me think that I probably should not be trying to reinvent the wheel. I am sure there are others who teach this course who have come up with creative activities. I just need to do some searching.